Sunday School meets on Sunday mornings at 9:30 in the Education Building, located to the left as one faces the church. Throughout the year, most of the classes focus on the Presbyterian curriculum entitled We Believe, while some participate in special study themes. Room 201. Our trained nursery employees, along with congregational volunteers, create a nurturing and Christ-centered experience as the children from birth through three years of age begin to develop their worship routines. We are open from 9:15 to 12:00 noon for morning Sunday School and Worship. Preschool – Kindergarten: Room 207 ; Grades 1 & 2: room 209. Our teachers in both of these classes use “Growing in Grace and Gratitude,” a Presbyterian Church USA children’s curriculum. This series will help children to worship and serve God in grateful ways. 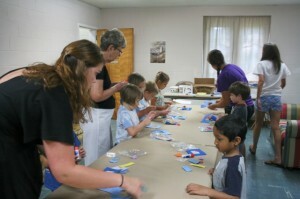 “Shepherds” help guide the class during Sunday School time. Grades 3, 4, 5: Room 100. This class focuses on Old and New Testament stories as well as learning the books of the Bible and Bible verses. They practice the Kyrie, Doxology, Lord’s Prayer, Gloria Patri, and Apostle’s Creed, allowing them to participate fully in worship. This class studies the curriculum entitled “We Believe” (PCUSA). Youth (Grades 6-12): Room 106 (Youth Room). This class uses curricula designed to address the questions and concerns of this age group through discussion and reflection. Children in 4-year-old preschool through 2nd grade are invited to leave the Sunday morning worship service (except the 1st Sunday of each month) to experience God’s presence in their special chapel located in Room 21. The Godly Play curriculum uses an experiential discovery method of learning to engage the whole child – hands, heart, mind, senses and intuition. Bible stories are told with three-dimensional materials and children are encouraged to move into larger dimensions of belief and faith through ‘wondering questions’ and personal response time. This class is for adults who enjoy group scripture study and exploration through shared interpretation of the day’s lectionary. We read the scripture aloud and silently ponder what it means. Then as a group, we ask and answer questions about Jesus’ comparison to our lives, and prepare to hear the pastor’s message on the same scripture. We invite you to join us in reading, sharing and praying together. This class for adults focuses on Bible scripture using the Uniform Lesson Series The Present Word. All adults are welcome to join the lively discussion in this class. This class involves Bible study including class participation in discussion as we seek to understand God’s word. Last year we studied the books of Genesis and Acts. In both cases, we studied beginnings – the beginning of the world and our Judeo/Christian faith and the beginning of the church. We will start this year looking at Galatians which addresses topics and events concurrent to the book of Acts as well as a number of theological topics, including faith and the law, justification, purpose of the law and being the children of God. Biblical Justice Forum: Church Library. Adults in this class study current issues of concern to Christians, such as racial injustice, nonviolence, environmental justice, Middle East peace, etc. and attempt to discern the church’s obligations regarding these topics. This class meets from 3:30–5:00 pm.